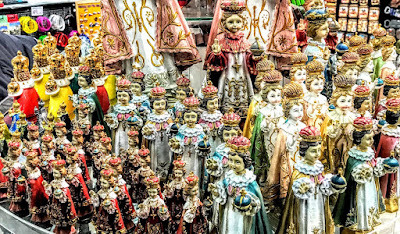 Who is the Child of Prague? And how did he get to Prague? The ‘Infant of Prague’ was a popular devotional statue in Ireland from the late 19th to the mid-20th century. During those decades, the statue was linked to folk customs about weddings, prayers for fine weather, and superstitions about warding away poverty from a household and a family. One custom involved placing a statue of the ‘Infant of Prague’ outside a bride’s house under a hedge or bush in the front garden to guarantee fine weather. Some people believed the statue needed to be outside the church where the wedding was taking place, while others buried the statue in the garden. A gift of a statue of the Child of Prague was also seen as an appropriate wedding present. Other traditions involved placing a silver coin, usually a ‘half-crown’ (2/6), under the statue inside the house as a talisman against poverty and hunger. 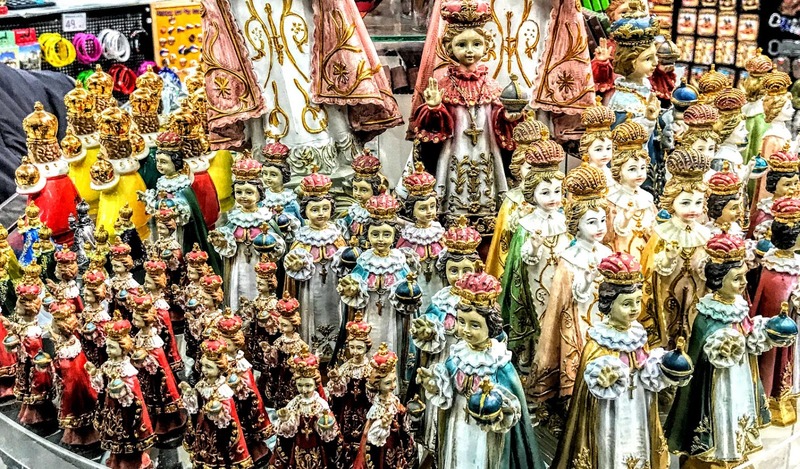 Throughout Prague this week, a variety of statues of the ‘Infant of Prague,’ from tiny to miniature, robed in copes of all liturgical colours, could be seen in the windows and on the shelves of souvenir and tourist shops. But who is this Infant? And how did he ever get to Prague? 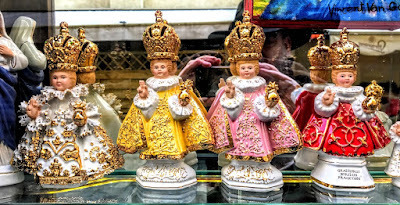 The Infant of Prague or Child of Prague is a 16th century wax-coated wooden statue of the Child Jesus holding a golden orb surmounted by a cross. The statue is displayed in the Church of Our Lady Victorious, a Carmelite church in Malá Strana, below the slopes leading up to Prague Castle. Pious legends say the statue once belonged to the Spanish Carmelite mystic, Saint Teresa of Ávila, and that it was donated to the Carmelite friars in 1628 by Princess Polyxena of Lobkowicz (1566-1642). The exact origin of the statue is not known, but historical sources point to a 48 cm sculpture of the Christ Child with a bird in his right hand, now in the Spanish Cistercian monastery of Santa María de la Valbonna in Asturias, that was carved around 1340. Similar sculptures were carved throughout Europe in the Middle Ages. The bird in these statues symbolises either a soul or the Holy Spirit. The statues were often dressed in imperial regalia, reflecting the aristocratic fashion of the time. One legend says a monk in an abandoned monastery between Cordoba and Seville had a vision of a small boy telling him to pray. The monk had spent several hours praying and then made a figure of the child. When the House of Habsburg began to rule the Kingdom of Bohemia in 1526, Bohemia developed close ties with Spain. The statue first appeared in 1556, when María Maximiliana Manriquez de Lara y Mendoza brought the image to Bohemia when she married a Czech nobleman, Vratislav of Pernstyn. A legend in the Lobkowicz family says María’s mother, Doña Isabella, was given the statue by Saint Teresa of Ávila. María received the family heirloom as a wedding present. It later passed to her daughter, Princess Polyxena, who donated the statue to the Discalced Carmelites or White Friars in 1628. The statue was placed in the oratory of the monastery of Our Lady of Victory in Prague. There, special prayers were said before it twice a day, and Carmelite novices professed their vow of poverty in the presence of the statue. When he heard about the Carmelites’ devotions and needs, the Emperor Ferdinand II donated 2,000 florins and a monthly stipend for their support. The Carmelite novitiate was transferred to Munich in 1630. The Thirty Years’ War brought an end to the special devotions in Prague, and in 1631 the Swedish army of King Gustavus Adolphus captured Prague. The Carmelite friary was plundered and the statue of the Infant of Prague was thrown into a pile of rubbish behind the altar. There it lay forgotten for seven years, its hands broken off, until it was found again in 1637 by Father Cyrillus and placed in the church’s oratory. Since then, the statue has remained in Prague and has drawn many devotees from across the world. The statue is routinely clothed by the Carmelite nuns in luxurious fabrics with imperial regalia and a golden crown, while his left hand holds a golden orb and his right hand is raised in blessing. In 1739, the Carmelites of the Austrian Province formed a special devotion apart from their regular apostolate. In 1741, the statue was moved to the epistle side of the Church of Our Lady of Victory in Prague. The statue is a 48 cm, wooden and coated wax image of the Infant Jesus. The surface of the wax is quite fragile. In order to protect the fragile wax surface, the bottom half below the waist is enclosed in a silver case. Since 1788, the statue’s two raised fingers have worn two rings, as a thanksgiving gift by a noble Czech family for healing their daughter, along with its golden blond hair. Some earlier records indicate that the original wig was possibly white. Several costly embroidered vestments have been donated by benefactors, including Empress Maria Theresa and Emperor Ferdinand I of Austria. A notable garment in the collection is an ermine cloak placed on the statue the first Sunday after Easter, the anniversary of the coronation of the statue by the Archbishop of Prague, Ernst Adalbert von Harrach, in 1655. Pope Leo XIII approved devotion to the statue in 1896 and instituted a sodality in its favour. Pope Pius X further organised the Confraternity of the Infant Jesus of Prague in 1913, while Pope Pius XI granted the statue its first canonical coronation in 1924. Pope Benedict XVI crowned the statue for a second time during his visit to Prague ten years ago, in 2009. The statue has a wardrobe of around 100 vestments. The clothes follow the customary colours for the liturgical seasons: Green, Ordinary Time; Purple, Lent, Candlemas and Advent; Red or Gold, Christmas and Easter; Royal Blue, the Immaculate Conception (8 December) and the Assumption (15 August). Today, over 2 million people visit the shrine annually. The weather is so cold in Prague this week – it has been around –2 these days, but it feels like –9, and there was a light dusting of snow last night – that I can be forgiven for thinking about snow and Christmas carols, and especially the one carol that we all associate with Prague. But first let me address some of the myths: Good King Wenceslas was not written in the Czech capital; he never was a king; his name was not Wenceslas; and there is no mention of Christmas or the Nativity – its setting is Saint Stephen’s Day (26 December), the day after Christmas Day. 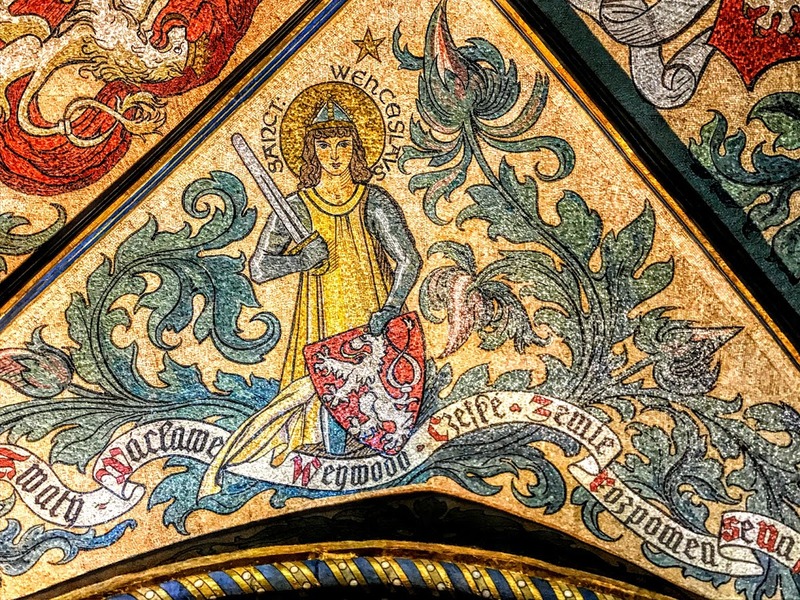 Wenceslas was a tenth century Duke of Bohemia, and his real name was Vaclav, or Vaclav the Good. I am not alone in wondering why a king might feel the need to take his retinue with him and trudge snow to bring pine logs to a peasant who already lives in a forest. Indeed, the verse that sets this story in the day after Christmas was invented by the English Victorian hymn-writer, John Mason Neale (1818-1866), when he published his translation in 1853, to extol the custom of employers giving their workers a present on what was also known as Boxing Day. Nor is the original song in Czech or set at Christmas-time: the tune selected by Neale, Tempus Adest Floridum, was a spring hymn in a Scandinavian collection Piae Cantiones, published in 1582, and dating back to the 14th century. This carol is not included in either the New English Hymnal or the Irish Church Hymnal, partly, perhaps, because the editors agreed with Dearmer, Smith, Vaughan Williams and other critics; and partly, I imagine, because this carol makes no mention of Christ, despite the fact that in provides an exemplary model of discipleship. 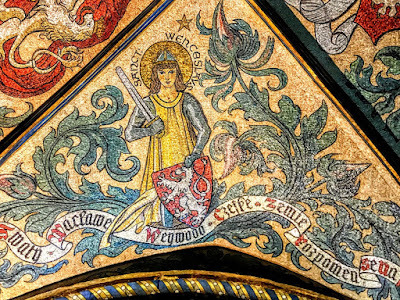 The man we know as ‘Good King Wenceslas’ was actually Vaclav I or Wenceslaus I, Duke of Bohemia. He was also known as Vaclav the Good, or Svatý Václav in Czech, and was born about 907. His grandfather was converted to Christianity by Saint Cyril and Saint Methodius, the missionaries to the Slavs. His mother was the daughter of a pagan tribal chief – although she was baptised before she was married. When young Vaclav’s father died there was a power vacuum: the young boy’s mother was banished and his grandmother was murdered by assassins – it is said she was strangled with her own veil. However, Boleslaus was not happy with the arrangement, and in September 935 he plotted with a group of noblemen to kill his brother. The three nobles – Tira, Česta, and Hněvsa – stabbed Wenceslas, before his own brother ran him through with a lance. Many years later, the Holy Roman Emperor Otto I gave him the title posthumously promoted him from being a duke to the title of king. Several centuries later, following his example, Pope Pius II walked 10 miles barefoot in the ice and snow as an act of pious thanksgiving. His saint’s day is 28 September. 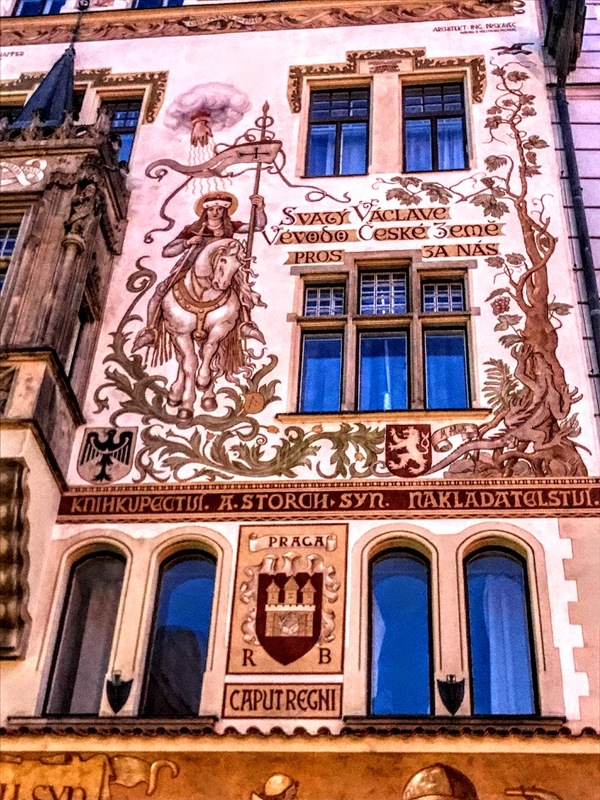 He is buried in Saint Vitus’s cathedral in Prague, and was recently made the patron saint of the Czech Republic. 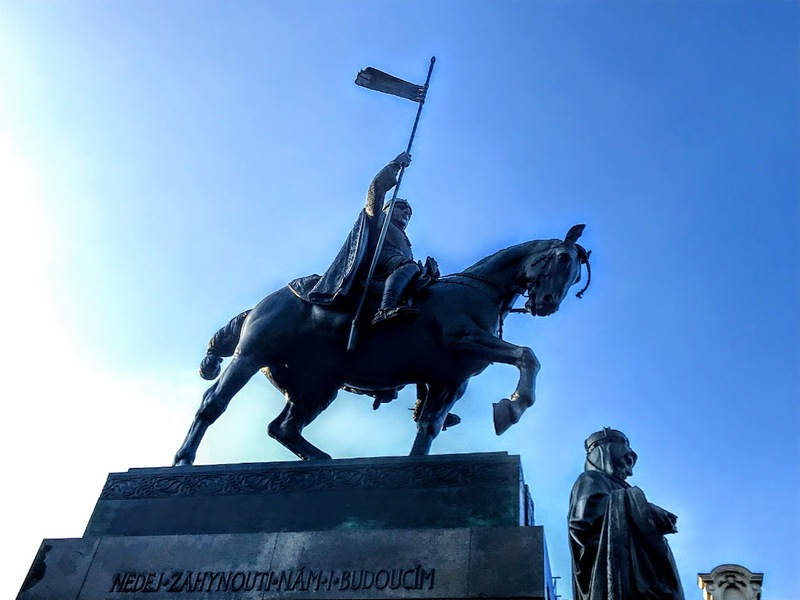 An equestrian statue of Saint Wenceslas, surrounded by the other patron saints of Bohemia – Saint Adalbert, Saint Ludmila, Saint Prokop and Saint Agnes – looks down the full-length of Wenceslas Square in Prague. This is a popular meeting place in Prague, and was the venue for demonstrations against the Communist regime 50 years ago in 1969 and 30 years ago in 1989. 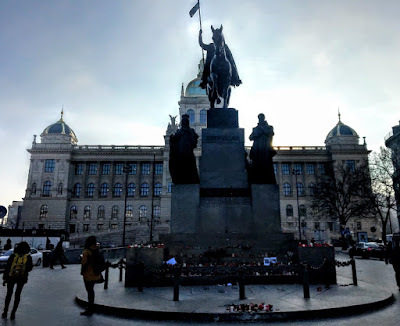 It is said in Prague that if the Czech Republic is in danger this statue in Wenceslas Square will come to life, Good King Wenceslas will raise a sleeping army and he will reveal a legendary sword to bring peace to the land.